Updates to Lyla's profile since your last visit are highlighted in yellow. I have been married for 25 years. Kent and I have lived in Havre, Hinsdale, Choteau and now Stevensville. I ran a day care for 17 years. I volunteer at the city library, church and school, and teach adult ed card making classes. Update at the Kultgen house. March 21st my husband Kent became Dr. Kent Kultgen BS,M. Ed, E. Ed. In short, a doctor that can't help anyone. I am so excited that he is done with school, now I can go back to college. We currently live in Snohomish, WA. We love being 28 miles from the city. All of our children and grandchildren live out here. Kent is superintendent of the Snohomish school district. We are told it is a small district, with only 10,500 students. Mary Peterschick and I have too many funny stories to share, and none of them I want my mother to know about. Me, after I talked to Clinton, the man had toast in his hair! 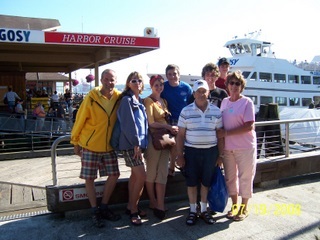 The whole family in Seattle- before a boat ride, some were a little green after. Lyla and Ralph Bye- sitting in the accordian part of a bus in Seattle. Alice, Oliver, Eli and Kyle- The Nerd Olympics. If you need your computer fixed, DNA explained, battle tatics of the second world war, or Monty Python's Holy Grail re-enacted- these are the guys to see. They are looking for new members! My Aunt Nina took me to a Victorian Tea in Stevi, which proves you can dress me up and you can take me out, but I stick act like a girl from the sticks.